Right from its launch in 2010, it was easy to spot the merits of the Juke. Its smaller size isn’t what Nissan’s little SUV has become known for; its unusual style is what really garnered attention. With its unique lines, it’s a somewhat polarizing vehicle: you either like it or you don’t. But it sure does make for a lively debate. The Juke’s most attractive quality isn’t its appearance, but how much fun it is to drive. Although it feels more like a responsive sports car than an SUV, buyers remain hesitant due to its reduced size and space, as this makes it a lot less practical for families. This ultracompact SUV represents a good second vehicle, but not everyone can afford this kind of toy. The Juke has very few direct competitors and absolutely none with as many variants. Its only real competition seems to be the MINI Countryman—except when it comes to price, with the Juke much more affordable than the Countryman. As is the case with the MINI, Nissan is offering the Juke in more modest versions, but the manufacturer has also created some much more extroverted versions. 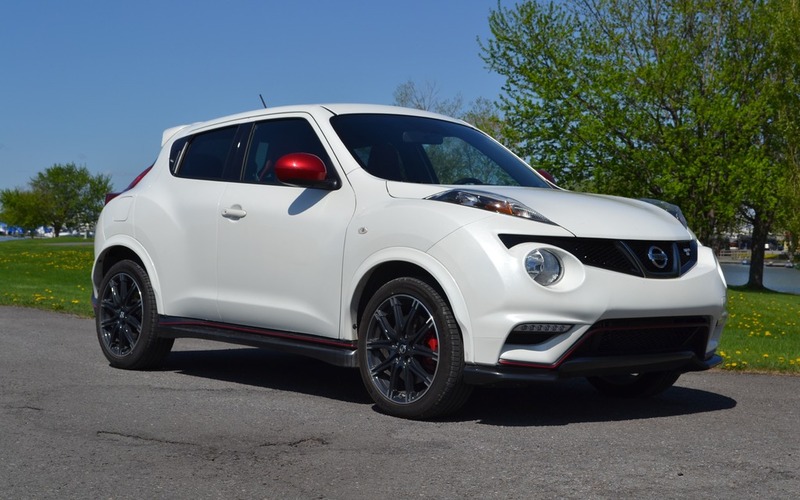 To give the line-up a little more punch, the Juke NISMO (for NISsan MOtorsports) appeared on the scene last year with a more dynamic interior, spruced up exterior and superior power. Nissan has gone a step further this year by introducing the Juke NISMO RS, a third version that pushes this vehicle’s limits even more. It has the same basic DNA as the conventional Juke NISMO, but in a more concentrated formula. Under the hood, the Juke NISMO RS has the same 1.6-litre four-cylinder turbocharged engine with direct injection, but with 215 horsepower instead of the 197 found in the regular NISMO or the 188 found in the basic Juke. This additional horsepower comes primarily from the optimization of the engine management system and from the adoption of a less restrictive sport exhaust. Our only real disappointment was the fact that there is no possibility of all-wheel drive. Since the Juke Nismo RS comes only with a six-speed manual gearbox, it is impossible to get it with all-wheel drive. This represents a distinct disadvantage compared to the regular NISMO, which is offered with a continuously variable transmission. While less sporty, it can be paired with Nissan’s AWD system—a big plus. At least the RS has a helical limited slip differential that maximizes performance in more intense driving situations. On the outside, the differences between the Juke Nismo and the RS are pretty insignificant. Both feature a more aggressive fascia that lets a little more fresh air through to the turbo engine, side skirts, red mirrors and a slightly lower suspension that reduces the gaps in the wheel wells. However, you’ll see right away that this is no ordinary Juke, especially with its pretty 18-inch black rims. The red brake calipers also make the RS version a smidge easier to spot. The easiest way to identify the Juke RS is to look inside. It’s the only version equipped with Recaro sport seats with red stitching and suede inserts in the centre. These stylized seats have surprisingly good lateral support, which is immediately noticeable when you sit down – you have to pass over the bulge and then let yourself drop into the seat. We love them! The carbon fibre trim, alcantara-covered steering wheel and metal pedals put the finishing touches on the Juke RS. Overall, there’s noticeable attention to detail. The design of some of the components has been quite fittingly compared to those found in the MINI. While both front seats are roomy, the same cannot be said for the rear seats. Although the Juke feels like a two-door vehicle at times, especially with its well hidden rear door handles, accessing the back seat is actually quite simple. However, the none-too-large cargo volume is its Achilles’ heel. Once you’re comfortably seated and have pushed the four-cylinder turbo’s start button, you’ll like the rich and muffled tone that emanates from the engine, despite its small capacity. Press the accelerator and you’ll feel the 210 lbs.-ft. of engine torque quickly and without any real lag. However, there is a rather significant torque steer effect, especially on uneven surfaces. That’s why all-wheel drive would be useful. In turns, the Juke offers neutral handling. Its four-wheel independent suspension keeps body roll under control. Of course, the beast’s chassis has been reinforced to better control the available power while the steering is more responsive compared to the other versions. The result is a vehicle that is not only more powerful, but also more balanced. Few people think of the Juke first when the time comes to shop for a new vehicle. But once they take the wheel, most are won over by it. The only thing keeping the new Juke NISMO RS from true greatness is the possibility of all-wheel drive, especially considering its relatively affordable asking price of less than $30,000. 8/10	Its small size helps in this regard. 8/10	You like it or you don’t! 7/10	Not the most spacious. 9/10	The only thing missing is all-wheel drive. 8/10	Stylish, sporty and fun to drive.